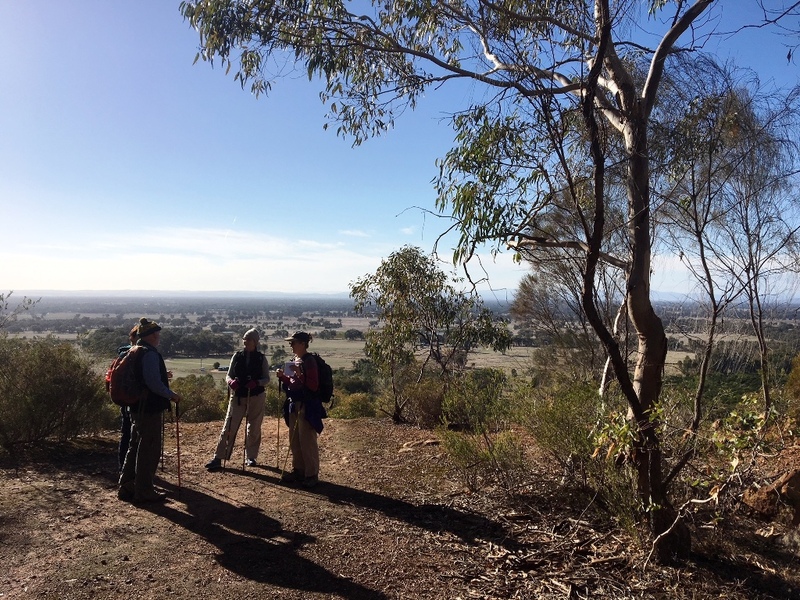 We had 10 participants on this walk, with two casuals from Corowa on their second walk, and a new casual from Wangaratta on her first walk. It was a fine day, but cool wind at times, and gloves/beanies made several appearances. This was an enjoyable walk of nearly eight kilometres (GPS said 7.68k) starting at Delloro Road, and heading to the Quarry, where we enjoyed the views, and checked out the ruins from the quarrying days. Then it was onto the Sunrise Loop, where we took the northernmost track towards the vehicle track to have morning tea. Afterwards, it was onto the Taminick Loop, a little difficult to locate at the start (not walked on often enough), along which we followed a beautiful gully with many grass trees and rocky outcrops; many a photo was taken here. We then continued along the Taminick Loop, enjoying the views along the way, and took in the steep descent, and then ascent, before having lunch. Then we were back on the Sunrise Loop, returning to the cars at Delloro Road, enjoying more views along the way before Pat’s cuppa. The valley is greening up with the rainfall from the past 10 days, and we enjoyed the clear skies and distant views, including to the snow on Mts Bogong, Hotham and Feathertop. NB. 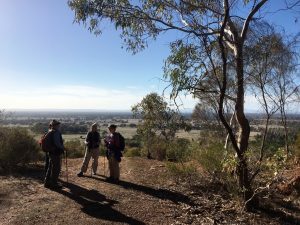 The walk scheduled for that day (the Stone Columns) has now been replaced by a walk from Lake Sambell (Beechworth) to Lake Kerford and the Wallaby Mine. This 10-12 km walk is graded Easy/Medium. This is a familiar walk with a new twist – the addition of a visit to the Wallaby Mine and the old battery. The mine is in the Beechworth Historical Area, and involves a gentle descent and climb out. The rest of the walk is flattish, following the valley of Silver, Deep and Hurdle Creeks. A choice of two walks. A hard walk of approx 21km circumnavigating Lake William Hovell. Most of this walk is on 4WD roads, and includes a river crossing, a steep climb, mountain ash forest and views over Lake William Hovell and the Upper King River Valley. Bring along the hiking poles, and old runners to cross the King River. If you’re not into the river crossing and a steep climb, then the medium walk may be for you. This walk is along a 4WD road on the west, and southwest, side of the King River, and Lake William Hovell and returns back to the dam wall.